Today, I decided to spend this sunny and warm day outdoors and enjoy a nice meal out! So as I was walking through the busy streets of New York City and heading into my favorite place, Central Park, I was thinking about where I should eat. Since the temperature was in the high 80’s I was craving something light, satisfying, but still packed with flavor, yet warm-so I chose soup. Now I know many people would question my choose but I grew up eating soup almost everyday, even in the summer. It’s a great way to get in your protein, vegetables and some carbohydrates. The great thing about soup is that you can eat many cold, most hot, with or without creams, with or without noodle, rice, dumplings, heck it is very versatile, so you’ll never get bored with it! My mom used to make the best soups in the world! They were so tasty that you would lick your spoon after every mouthful! Her beef soup with tiny liver dumplings was out of this world!!! And yes, I did say liver dumplings! They tasted like meatballs, and who does not like meatballs? Her broth was so clear, not murky like some I have seen and packed with intense flavors. But I also have to give credit to the Asian community for their soups. They really know how to make delicious soups. Here in New York City, like in many cities you have all different neighborhoods that serve food from different cultures/countries. After walking around so much I actually wound up in Korea Town. It is about a 3 block long stretch on 32nd Street filled with Korean restaurants and some Korean specialty stores.I haven’t been there in a long time so I just randomly picked a place that by the way, you need to know this, had an “A” rating. That’s from the health inspection. You do not want a B or C. Just like when you were in school getting your grades. And why should you, it’s NYC, there are restaurants a penny a dozen! So basically I was the only non-Korean in this place. That’s a good sign. It is a small place, about 40 people seating capacity. Everyone was speaking Korean, but my waiter did speak English. Even though I can speak 3 languages, Korean is not one of them. So I ordered a Ramen noodle soup called off their menu “Yupgi Ramen.”. It is named after the restaurant “Yupdduck’ where I ate. It is served with bean sprouts, dried seaweed, scallions and onions. You may add other items so I chose, fresh seaweed (it tastes like spinach from the ocean), and pork cutlet. What I did overlook was that it is rated a very spicy dish, and boy was it spicy- a hot spicy! Spicy helps clear your stuffy nose, so eat up! But I also highly recommend this soup! So, if you are in the mood for some,tasty, Korean soup (or other Korean food) and are in NYC, try this place out. It is called Yupdduck, 2 West 32nd Street. To give you an idea of location; The Empire State Building is on 34th Street and 5th Ave, this place is 2 blocks south on 32nd and one block east. Explore your horizons with foods from all over the world, and as always, Enjoy! 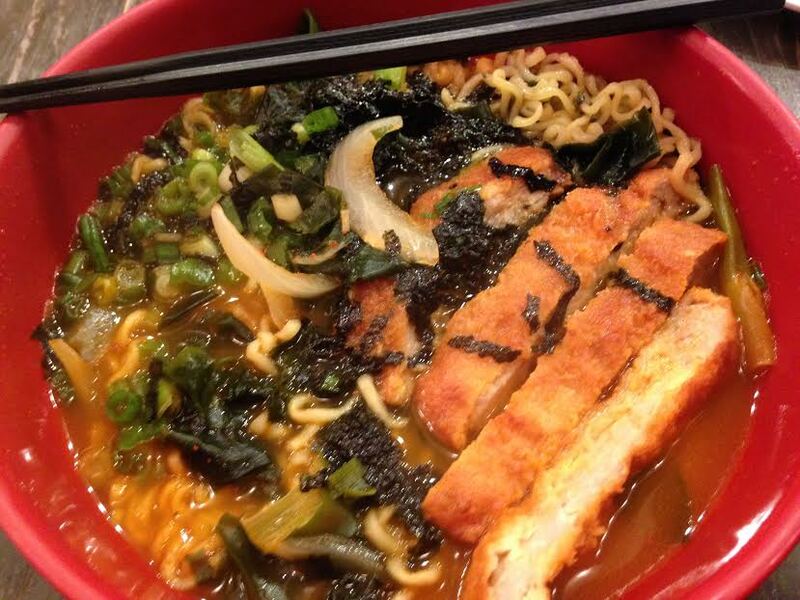 That ramen looks amazing, I would go for a bowl right now! Thank you for your comment. And by the way, you are not weird for eating what you enjoy! Wow sounds delicious! I’ve only tried Japanese style ramen while eating out. I never knew there was Korean ramen! Will try 🙂 Thanks for a great post! Hi, thank you for your comment! Yes, you should definitely try this soup, it’s very tasty!